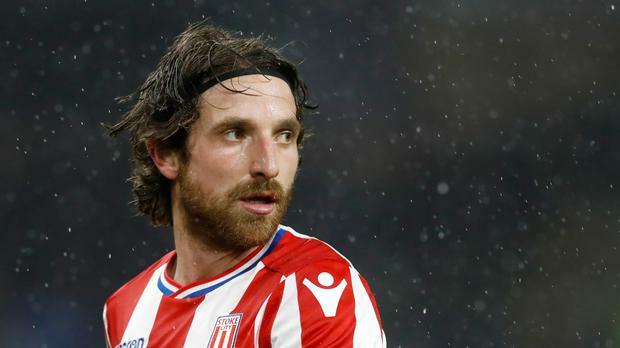 Midfielder Joe Allen feels there is finally light at the end of the tunnel for Stoke as the new year approaches. A run of just three wins in 16 Premier League fixtures, and five defeats in six, had cranked up the pressure on manager Mark Hughes when the Potters were flirting with the relegation zone last week. However, having followed up a crucial home win over West Brom with a battling point at Huddersfield on Boxing Day, Allen insists there is a more upbeat mood around the Stoke camp prior to their final fixture of 2017 at Chelsea. "We want to end the year on a great note and take that into next year - we're hopeful we can be that much better," the Welshman said. "The feeling is that we have turned a little bit of a corner and let's take that into next year." Antonio Conte's Blues dismantled Stoke 4-0 at the bet365 Stadium earlier in the season in the first of five games where the Potters conceded three or more goals in a single match. It has been alarming to Stoke fans how Hughes' men have unravelled when falling behind but, after coming back from a goal down to gain a point at Huddersfield, Allen is confident those type of performances are behind them. "Hopefully we're starting to learn from our mistakes," he added. "We've been a bit slow with it. It's been drilled into us, in all fairness, but the Premier League is unforgiving. You can't lose your heads and start chasing games because teams pick you off and punish you. "The signs are promising that we've learnt from that." Chelsea will still fancy their chances of administering another thrashing given the Potters are set to be without three centre-backs - Blues loanee Kurt Zouma, captain Ryan Shawcross and Bruno Martins Indi. "It's not ideal but at this time of year you almost come to expect it," Allen noted. "We'll get on with it, work hard, and whoever comes in knows the role and what they'll have to do. "It's not an easy game going to Stamford Bridge but we'll throw everything at it because we want to keep this two-game unbeaten run going. "I actually fancy myself as a centre-half...I think my stature goes against me a little bit! I can't imagine I'll be put in there on Saturday."